Hawaii's new interisland carrier go! announced temporary $19 one-way fares yesterday, another example of how it is shaking up ticket prices in the state. Jonathan Ornstein, right, head of go! 's parent company, conversed with another passenger yesterday morning during a preview flight. Hawaii's skies are haunted by the ghosts of interisland airlines. Carriers such as Mid-Pacific, Discovery and Mahalo all tried and failed to survive during the last 25 years. But Phoenix-based Mesa Air Group Inc., whose new Hawaii airline go! will begin flights tomorrow, appears better able than those long-dead carriers of sticking around in what has become a shrinking and more competitive marketplace. Mesa, which ended the first quarter with more than $282 million in cash and equivalents, already has shaken up the interisland fare structure. It set off a fare war in March with its $39 one-way fares, followed that up last month with $59 round-trip weekday fares, and then yesterday pulled out its trump card: $19 one-way fares that are available for purchase through tomorrow for interisland travel until July 9. Hawaiian Airlines matched the $19 fare, which does not include fees and taxes, but Aloha Airlines did not match the new offer. "People have asked, 'Can you sustain these fares?' and my response has been we're going to have a $39 fare available going forward and our highest fare is probably like $79, which is still lower than the lowest (interisland) fare the day before we started," said Jonathan Ornstein, chairman and chief executive of Mesa. "What I think will be a big driver toward our profitability is when we can introduce slightly larger aircraft, which we intend to do in 12 to 18 months." Eighty percent of Mesa's seats on its 32 flights scheduled tomorrow between Honolulu and Lihue, Kahului and Kona have been booked, Ornstein said during a press conference yesterday. He said the total numbers of bookings for the month were above expectations. Those numbers will go higher with the $19 promotional fare. Given the smaller size of go! 's 50-seat Bombardier CRJ-200s and their lower operating cost compared to larger narrow-body aircraft, Ornstein said go! could fly the planes empty, lose $25 million for the year and absorb the losses with the more than $100 million that Mesa is projecting to make this year. "I want folks to know that Mesa is financially in a position where we can do things for a long, long time," he said. Despite growing competition, interisland prices have climbed significantly over the last five years amid rising fuel costs and because of a shrinking market that has seen more mainland carriers fly directly to the neighbor islands rather than route passengers through Honolulu. Also, the opening of major national retailers such as Home Depot on the neighbor islands have left fewer reasons for those residents to come to Oahu. Both Hawaiian CEO Mark Dunkerley and Aloha CEO David Banmiller publicly have questioned whether Hawaii could support all three carriers. But Mo Garfinkle, who has consulted for both Mesa and Hawaiian, thinks there's room for everyone. "The market has never been able to accept three airlines to date, but with one of the airlines operating CRJs, it's possible three can survive," said Garfinkle, CEO and president of Arlington, Va.-based GCW Consulting. 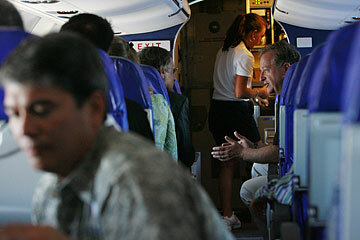 "Of the airlines Hawaiian and Aloha, it's clear that Hawaiian at the moment is stronger. But they've had a long history of one being weak and then the other being weak, so the past is not necessarily an indication of the future. It's entirely possible (they all could survive), but it may require some capacity adjustments or lower margins for the current carriers in the interisland service." Ornstein said he also believes all three carriers can co-exist, noting that go! 's five-aircraft operation will add only about 3,100 seats a day into the marketplace, or about 10 percent of the 30,000 combined capacity offered by Hawaiian and Aloha. "I would suggest that given the fares being charged, that they have artificially held down demand," Ornstein said. "And with our fares, I think we're all going to find that we're all going to run very full." Aviation consultant Mike Boyd said Ornstein has a knack of uncovering opportunities. "Jonathan Ornstein doesn't do anything half-baked," said Boyd, president of the Boyd Group in Evergreen, Colo. "Mesa can find value where mere mortals see nothing. I think this is something that's going to last. It may end up really clearly doing something we've wanted to see for years in Hawaii -- where you can get to the neighbor islands cheaply and have a couple of options." Ornstein said coming into Hawaii is a low-risk proposition for Mesa because it will only have five planes here by the end of the month, with one of the aircraft serving as a spare. Mesa has approximately 180 planes in its system. "If we were putting in 30 aircraft, it would be a much higher risk even if the prospects were better," he said. Ornstein said if he could have anticipated the response from consumers, go! would have started off with 90-seat aircraft and been profitable in its first month. "But being a little more conservative, I thought better to start with a smaller airplane and then grow into a larger airplane," he said. Aloha and Hawaiian, who have more to lose with Mesa invading their interisland turf, both have emerged from bankruptcy during the last 13 months in stronger financial shape. Still, neither airline has been happy with Mesa coming into town. "Over the years, we've seen many startups come and go with goofy fares designed to steal passengers away from Hawaii's homegrown airlines," said Thom Nulty, Aloha's senior vice president of marketing and sales. "While Aloha will always be competitive, we will also act responsibly to ensure that Hawaii's people have the high-quality, reliable, full-size jet service they expect from us." Hawaiian, which has sued Mesa for allegedly using proprietary information that Mesa gathered as a potential investor during Hawaiian's bankruptcy, said it will stand up to the challenge of new competition. "We know that people will shop and compare and we're confident they'll appreciate Hawaiian's high quality of service, proven track record of reliability and our commitment to the community," said Dunkerley, the company's president and CEO. "We're ready to compete." Go!, which conducted a preview flight yesterday for the media and Hawaii business leaders, has hired about 40 to 50 people from the state and has about 150 people in its Hawaii operation overall. That number doesn't include ground handlers, whose hirings were outsourced. The new carrier also said it signed a sponsorship agreement with the local band Big Every Time, also known as B.E.T. The band's South Pacific reggae/hip-hop-style music will be used as go! 's corporate sound, and the group's music will be played on flights, with the band members' voices used for the onboard announcements.